Hooray! My first full day in normal shoes for six months. That’s a really big HOORAY! After hundreds of pounds on private physiotherapy, hours and hours of tedious exercises, six sessions of ultrasound and a small fortune on pain-relieving gels, fancy foot support insoles and high tech ankle straps…. it turns out all a girl needs is a pair of pretty pink shoes. And those are my feet in them, minus the ugly ankle brace that has necessitated the wearing of dull wide trousers since November 3rd – the morning I woke up with ‘plantar fasciititus’ (miserable, miserable condition: love, consolations and deep, deep sympathy to fellow sufferers out there). It has really got me down this winter, it was the condition I gave up moaning about in Lent. And, as if in preparation for Easter day, I had a terrible day on Good Friday, the pain was as bad as ever. I was so fed up. I felt like I’d have this for life. However after a good sob, I took myself in hand and gave myself a lecture on the difference between thinking about doing the exercises and actually doing them: every day, 10 minutes in the morning and 10 minutes at night. I recommitted myself to calf stretches, knee dips and toe lifts and have been doing them religiously (in every sense of the word) and finally … finally… 3 weeks later I can feel improvement. Enough to go out and buy these shoes out of sheer rebellion. I just could not face wearing my clumping walking boots all summer, I’ve worn them since November anyway and they are starting to fall apart. And they work. Yee-ha! This morning I delivered a hour’s talk standing up and am not in agony as a result! Amazing to be able to do something I just took for granted before. So how come these shoes have helped when so many others have left me crippled? Well obviously it’s because they are pink and very pretty. 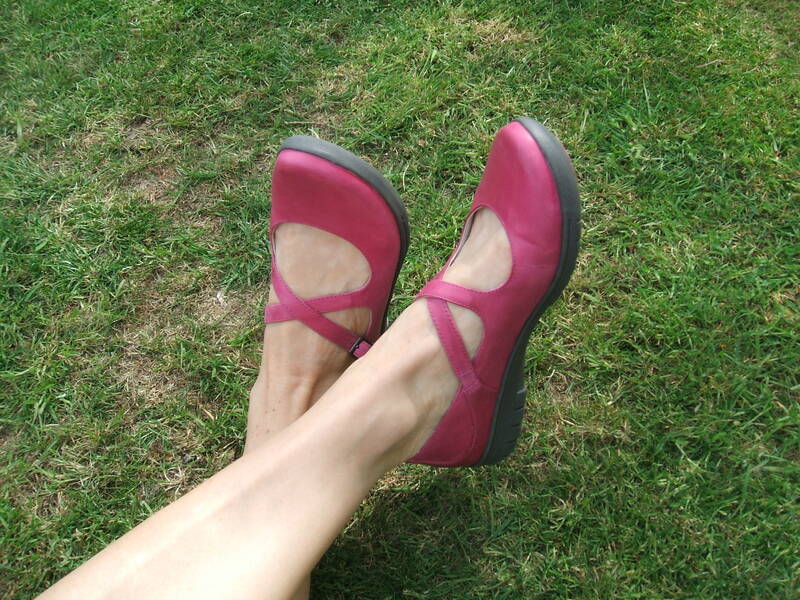 And like Dorothy in her magical ruby slippers I feel wonderfully pink and pretty wearing them. P.S. Five days later: possibly my joy was slightly premature. I seem to be only able to wear the pretty shoes for short periods. The rest of the time I content myself with stroking them! A few more weeks/months of calves stretches to go I reckon but I am making (tediously slow) progress. Ouch!!! I remember plantar fasciititus and that is my reaction. I got it playing cricket for the church (at which I’m usless – cricket not church I hope) and thought I’d bruised my ankle at the time. It was the running in non-running shoes on hard lumpy grass that did it. Yes it was calf stretches, knee dips and toe lifts for me too but as I was fit and healthy all those years ago it didn’t take me so long to get back running. Still I think you were right first time – it is the pinkness that did the trick. My youngest daughter spent 12 weeks in traction followed by a full-body cast after fracturing her femur at the age of 5. When she was finally released and able to begin walking again, we let her chose new shoes. They were red, pink and yellow – and they really helped!